A company manufacturing PVC granules moves the product using pneumatic transport systems terminating in a cyclone separator. The arrangement is typical of the transport systems commonly found in industry. Within each cyclone, the air exhausts through a perforated steel tube. This acts as a sieve, avoiding the small plastic wastage that would otherwise occur. The cyclones were producing a very shrill, penetrating whistle (at 497 Hz). This dominated the entire production area. As well as being extremely annoying, the whistle produced a sound pressure level of 110dB. It was diagnosed that the whistle was generated by a flow-induced acoustic resonance. This was confirmed by inserting a 10 inch square piece of cardboard into the cyclone. The cardboard broke up the aerodynamic resonance and totally eliminated the whistle, a reduction of 50dB (see figure below). The production version of the solution comprised a steel plate fixed inside each cyclone. The geometry of each plate was carefully “tuned” to provide maximum performance, matching that of the prototype. 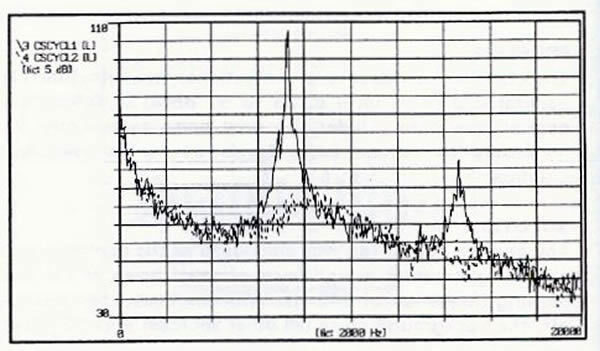 The overall noise fell by 25dB. Each steel plate cost less than £1.